and that means you are surrounded by people who are unafraid to come to your defense AND a high percentage of residents have guns and know how to use them. We live in a town filled with "good guys" so where these creeps surface, expect them to be shunned and watched. It's really only stupid idiots who try to harm folks around here. We have great police force who patrol a very small area and so get to wherever they are needed pronto. A 35-year-old Ligonier man was released Thursday from the Westmoreland County Prison after posting $10,000 bond after his arrest earlier in the day for allegedly assaulting a Ligonier woman and carrying a firearm without a license. Richard M. Leshko, of 207 Bunger St., allegedly grabbed the woman by the neck and threatened her Wednesday, according to a complaint filed by Ligonier police Officer Amber Noel. Police said Leshko then fled the Ligonier residence at 11:07 p.m. Wednesday in a pickup truck. He was apprehended early yesterday. Leshko was arraigned before Mt. Pleasant District Judge Roger Eckels on charges of carrying a firearm without a license, harassment, reckless endangerment and simple assault. A preliminary hearing is scheduled June 6 before Ligonier District Judge Denise Snyder Thiel. May Wine Dinner at The Ivy Cafe. TWENTY FIVE smackers to get a copy of the Ligonier Borough Zoning Ordinance. I'm scanning it into PDF format and posting it as soon as I can find that password for our FTP upload. Might have to wait for the brains of the operation, JF, to come in. We'll have an easy to find link here ASAP. Quemahoning Dam has been giving up walleyes up to 22 inches, said Rich Kacsuta of Loyalhanna Fishing Post in Ligonier. It makes living in Ligonier worth it to me. Forget about the suburbs. For me, the choice is living in the city and visiting the green OR living in the green and visiting the city. So, I live in the green and vacation in the city. B I N G O !!!!! You can play Bingo every Monday at the Ligonier VFW Post 734 on East Main Street. Dead center in the shot is a black bear fleeing back to the woods. He was attempting to cross 711 and a noisy motorcycle scared him. i have yet to find more than a handful of people who have expressed positive sentiments toward "arborgate" and "the village". in the rare case that someone tells me they like either of those developments, i begin to calmly explain the multitude of reasons both of those developments actually erode, though not entirely, the fabric of this community...at least on a planning level. "the village" is just like the movie with the same name. it's a pseudo-gated community that COMPLETELY turns its back on the neighborhood and attempts to create its own mini-town. thus, the need for the ridiculous tag: THE VILLAGE. i continue to be under the impression that ligonier, in itself, is small enough to be considered one community. it doesn't need, and should discourage, the breakdown of the town into little enclaves reminiscent of suburban planning. is the armory to be called "creekside" or "squirrel valley"? luckily, "the village" is tucked back far enough into town that people can reasonably avoid it. take a stroll down that block...notice how every single other house on that block has a front porch that encourages interaction between home owner and pedestrian. notice how "the village" only has a white picket fence (don't cross into our compound unless you live here) and blank brick walls that face the street. i won't even bother pointing out that once you get inside the sub-community all the houses are dominated by the garage. 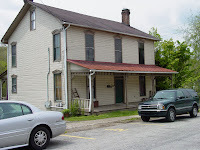 is there anyone who thinks that it would be a good idea to take pictures of this development, put them on postcards, and use those to promote the town of ligonier to the general public? is it unreasonable for a developer to consider this one question: once my stuff is built and i leave this town, would i feel fairly confident that my product could proudly represent ligonier on a postcard?? "arborgate" - NO. "the village" - NO. west church street development? - YES. My point is we have so many fun things around here but what music or song would you say sums up our little town? I'd love to have a contest and I am not sure how to do this? Diane wanna help me? I just think it'd be fun to see. The idlewild contest thing sparked this thought. Another rug camp! 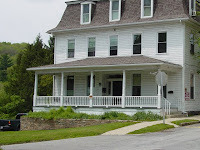 I went back to Ligonier, PA for a workshop at the Woolley Fox with Barb Carroll. Lots and lots and lots of hooking was done! What do you get when you take the words Idlewild Park and then add the words Family Reunion? CONTEST!!! Thanks, Steve, and you're right. We ARE interested. What do we have to do? I love you Farmer's market! Ok so I had to post about the Glorious Farmer's Market experience today. I was soooo excited to wake up to a nice sunny day and go down there. I must say I had to HOLD back on purchases. I did however get some rhubarb, a lavendar plant, and a beautiful shawl that I cannot take off! The shawl is a blend of fall colors and out of a mohair blend. I have had so many compliments on it. I am not a shawl girl but I fell in love with it the moment I saw it looking at me. I was eyeing it up and then some lady took it!!! After I blatantly was talking LOUDLY about how nice it was. Well I was a lil ticked off to say the least. After milling around and around and around :-p I saw that it was back on the rack! Well having the generous mother that I have she insisted that it was an early birthday present, mind you my bday is August 24 lol. If you stop by the shop I have it on. I also ate my breakfast down there consisting of pierogies :) :) beef jerky and rasp lemonade! YUM. Mum got a book about cats for a present for a friend. Go talk to the guy that has written 3 books and the wifey wrote a recipe book! They are so fun to talk to. Props to Jim Mikula for keeping that Farmers Market so wonderful!!! I think I'll try to keep a going record and attend every saturday. Hope to see you next saturday!!! THIS IS A MUST STOP NEXT TIME. I'D LOVE TO FIND A OLD PICTURE OF OUR THEATER BUILDING. 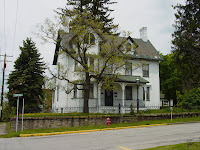 I'M ALSO ALWAYS ON THE LOOK OUT FOR OLD PICTURE OF HOMESTEAD. IF YOU HAVE A PHOTO OF THE OLD LEONA THEATER, I'D SURE LIKE TO SEE IT. 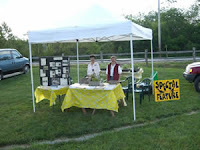 Ligonier Country Market had a fantastic opening day. I was surprised that I was directed to the back parking lot when I arrived. There were two full parking lots this morning but there was no feeling of being crowded. I found what I was looking. Al my regular favorites were there. I bought two containers of tomatio salsa [not sure of the spelling], a jar of black currant jelly, a gift for a friend [cute pink apron made out of vintage fabric], and two loaves of bread, banana nut & cinnamon. On Friday, the group was among 38 recipients receiving about $300,000 in grants through the Laurel Highlands Visitors Bureau. 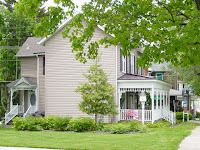 The Cottages at Millbank, Ligonier Township, $3,952 for a Web site, advertisements and brochures. Idlewild & SoakZone, Ligonier Township, $20,000 to support advertising through Northeast Ohio in June and July. Ligonier 250, $10,000 for marketing to commemorate the 250th anniversary of the establishment of Fort Ligonier. Ligonier Highland Games, $7,500 for marketing the 50th anniversary of the games. Ligonier Valley Chamber of Commerce, $5,500 to market to antique enthusiasts. Ligonier Valley Railroad Association, $12,000 to complete flooring at the Darlington station, which will be used as a museum. Mountain Herb Shoppe, Donegal Borough, $7,500 for botanical gardens. Powdermill Nature Reserve, Ligonier Township, $10,000 for brochures and advertising. Ramada Historic Ligonier, $1,906 for brochures to be used at trade shows and the hotel. 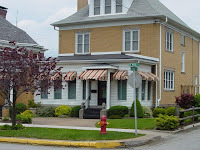 Southern Alleghenies Museum of Art in the Ligonier Valley, $5,000 for press kits for exhibition tours for educators and media. Stahlstown Flax Scutching Festival, $3,500, for an advertising campaign involving other area festivals as well as brochures. Have you heard? J. A. Cooper is opening a studio where the sandwich shop used to be across from the Fairfield Grille. 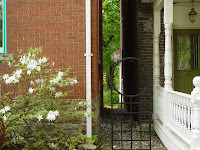 Ms. Cooper will be holding an open house at her gallery at 6 pm Saturday, June 21, 2008 followed by a reception for a private viewing of the show Portraits of the Eastern Frontier at the Southern Alleghenies Museum of Art from 7 to 9 pm. Original paintings and prints will be on sale during the reception, including two new releases by J. A. Cooper. Light hors d’oeuvres and desserts will be served. RSVP is not required but is requested by email (pictors@pictorsstudio.com) or phone 724-771-4102. 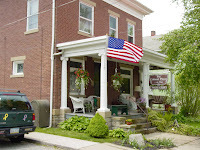 I don't normally talk about my business here on Ligonier Living. In case you don't know, I'm a title insurance agent and the general manager of The Closing Specialists on West Main Street. I've been hearing reports from all counties that the courthouses are full of people searching mineral rights. I had an employee in Clearfield County the other day - which is normally a quiet courthouse - and they were packed. With oil prices where they are, there's a bit of a bonanza or gold rush kinda feel to the momentum of these searching groups. I don't know what it will mean to you or to me but if you have property that may have mineral rights issues, you may wish to consult with one of the local attorneys in town to see if you should be concerned or perhaps have an opportunity for reward. Hmmmm....does she look sweet......or scared......or puzzled? OK, I'll admit that no matter what she sure is cute. 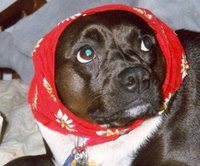 Visit the Ligonier Valley Library's new blog for all the info on the 3rd Annual Pet Photo contest. Diane, thanks for the post on the new web site for the Valley Players... I'm really old enough to remember a lot of that history and what does that tell you? Reading about Harry Lohr and Carlos Gonder really takes me back in time. I knew both gentlemen. Carlos was the manager of First National when I first met him (later Mellon and now Citizens) and Harry owned the lumber yard where the Borough now has a maintenance building, where the Baptist church is and the Prudential planned housing development is. I'm not sure of the exact details about distributing U. S. currency in earlier years, but the system evidently put the local bank's name on money that was entered into the local economy . 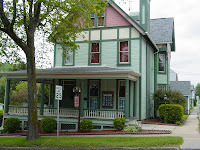 Jake Grimm, local historian and druggist also did some antiquing on the side. I spotted the five dollar bill in his show case and was fascinated by the fact that it had Ligonier on it and also the signature of Carlos Gonder who was at the time retired and still living in town. There are four signatures on the bill. I don't recognize the president's signature and Carlos was the Cashier at the time the money was put in service. It's a little hard to see on the small photo but his signature is in the lower left hand corner. I can email a larger jpg to anyone that might be interested in seeing a better and more detailed photo. I was also intrigued by the numbers 13658 printed in large numbers on the money that by coincidence is almost the zip code for our town. I met the author of this new book at our blogging class in the library. His name is Joe F. Stierheim. I new he had written a book because he was sitting in front of my husband and me at the lecture on Sikhism in the Unitarian's First Friday Series on the 2nd. I had overheard three women praising him for his writing but I didn't have time then to chat. Ralph is a very ordinary dog; a mutt, a cur. In performing a selfless act, saving a little girl from being hit by a truck, Ralph dies. But that is only the beginning of the story. In the Misty Place, a land in which he finds himself, he is given the opportunity of coming back to life and performing an extraordinary mission -- that of bringing peace to the world as a new Superhero, Americur. Ralph accepts the mission and thus begins a series of adventures that bring Ralph -- an the world -- to a new realization and a new future. I once had a small, tan dog named Ralph. He was a mongrel, a mutt, but he possessed intelligence and an attitude toward the world that was far above his station in life. He was kind and loving toward all creatures and went out of his way to be helpful to the other members of the menagerie that shared my life and his. I often wondered what he would do if somehow he were given the ability and power to fully express those qualities to the world. Out of those thoughts was born the idea for Americur. Order this book by calling 888-795-4274 ext.7876 or online at www.xlibris.com, www.amazon.com, www.barnesandnoble.com, www.borders.com or visit your local bookstore. Thank you, Butch, for calling me at 7:04pm when you found out they changed the date. I attended the last meeting and took careful note of the time and place so as not to miss this important meeting. I am curious about the notices given to the public. It was mentioned that the change was advertised in the Echo, however, I get my Echo on Thursdays by mail so that was a big help. I really miss Rick Schwab. Even before this evening, I'd been pondering how large a void we have in his absence as our editor. I miss seeing him around town with his camera. I miss seeing him at meetings. I miss the way the Echo used to be. I miss his column. I miss the editorial page because it's GONE. The letters to the editor are just GONE. Are people no longer writing or are the letters being severely edited? That said, you should know that there was NO ONE at the planning commission meeting from the press. Representatives from Montgomery & Rust were in attendance to present and discuss the West Church Street property. They presented two proposals, both of which included the construction of four single family detached homes in the form of condominium ownership. The declaration of a condominium will allow the project to move forward without variance requests as the common elements will sit upon the existing lots and no further subdivision is needed. After some discussion, agreement was reached that the structures could sit in line with the Tantlinger property and that they could have covered - not closed - porches in front. All agreed that this design would fit in well with the neighborhood and since it meets current zoning rules, no variances would be required. 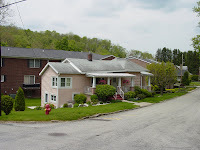 Let's have a big cheer because we need these houses in town and we need to have quality developers such as Montgomery & Rust interested in doing business here in Ligonier. There was no discussion of the Armory property. The next meeting - unless it is changed - is set for June 4th. The Valley Players have a new web site - love it! On April 5, 1920, Adriano Marozzi and Cesira Marozzi, his wife, conveyed to A. J. McColly Lot No. 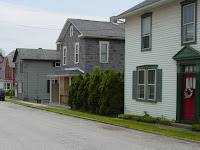 18 in the Borough of Ligonier, fronting 60 feet on Main Street and extending back 180 feet to an alley, and having thereon erected two frame dwelling houses [sic] and a blacksmith shop. the Ride of Silence.....I wonder if we'll see anyone riding through Ligonier? On May 21, 2008, at 7:00 PM, the Ride of Silence will begin in North America and roll across the globe. Cyclists will take to the roads in a silent procession to honor cyclists who have been killed or injured while cycling on public roadways. Although cyclists have a legal right to share the road with motorists, the motoring public often isn't aware of these rights, and sometimes not aware of the cyclists themselves. A coal truck accident in Westmoreland County left one man dead.It happened in Fairfield Township on Route 711, just south of New Florence around 1:30 PM on Tuesday. 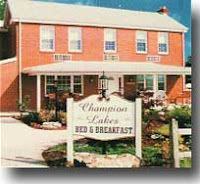 Did you know there is a Bed & Breakfast at Champion Lakes Golf Course? That's a great weekend get-away for golfers. Missy Daugherty has a knack for making pretty baskets. These baskets make wonderful raffle prizes for groups and they make nice gifts, too! Each basket is unique and created around a special aromatic candle. Missy uses only Mia Bella Candles which are high quality, long burning, soy candles. She has a stand at the Fairfield Grille, so stop over and sample a fragrance. Contact Missy at candlequeenmissy@live.com. "It's a good problem to have, having a surplus," Marnell said. "We're not raising taxes, and that's good news for our citizens in the current economic climate." For those of you who didn't know (and frankly, I couldn't find a mention of it anywhere locally) yesterday at Idlewild Park, Autism Speaks sponsored the Laurel Highlands Walk Now for Autism. There were forty nine teams in attendance, and though the teams numbered anywhere from two to about twenty five members or so, I never did get an official count. There were many, in spite of the sun hiding behind clouds on occasion and a few sprinkles that left us all feeling a bit soggy. The teams raised funds for autism research and also helped to raise awareness about the increasing prevalence of autism and the need for increased research funding to combat this complex disorder. For example, one in 150 children have autism, and a diagnosis of autism is made somewhere every twenty minutes. The walk was held throughout Story Book Forest, and there were resource tables, face painting, crafts and refreshments for all. Each team also had the opportunity to have a team photo taken. As of a few minutes ago, the official amount raised was $17000.00 for this particular walk, although I believe money is still being raised and submitted. In addition, there are also other walks being held all over the country including June 7th at Heinz Field in Pittsburgh. Perhaps you know of someone with autism, or perhaps it's time to find out exactly what this disorder is all about. More information can be found on the Walk for Autism site, or at the Autism Speaks site. Take a minute to educate yourself about this increasingly common disorder. 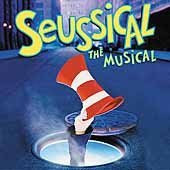 Audition for SEUSSICAL, the musical. This is a big week for the planning commission. There's a meeting on the 22nd and developers should be back to talk about the West Church Street and Armory properties. 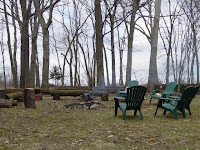 Here's a link to take a look at that picture and some other plans on the Montgomery Rust site. Is it just me or is the lincoln highway thing by Town Hall that has Hadley Martin talking broken? I meant to ask this several weeks ago. When I was being a "tourist" I tried it with my keys and had NO luck. Yes, I have tried it before and it worked. I hope we did not "lose" the audio, that is something so special! Farmers Market oh how I love thee! If you haven't gone or have missed it GO enjoy it, make memories, and support it!! Ah, the farmer's market. This event was something I didn't even know existed until last summer. After being told at work just how great the farmer's market is, I thought I would take a peek for myself. So, early one Saturday morning, my husband and I packed our son into the car and away we went. I love the drives to the market, because the quiet of an early summer morning is a refreshing break from the chaos of a typical week. I think it is safe to say that it was love at first sight! My excitement was overwhelming: so many talented people, creating things and growing things with their very own hands! 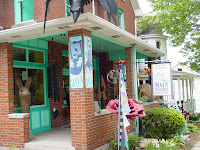 The market then became a Saturday ritual: We would stop at Tracy's Treats (lotions and soaps made from shea butter... this was always a treat for me- I've got a thing for handmade soaps). We would stop at Nature's Comeback Ranch for bison meat ( which is basically just like beef, only there is no fat! ), then it was off to Gosia's Perogies for homemade perogies. We also liked to make a special stop for our son for being such a good boy when Mommy and Daddy shopped: we would always get him a few packages of pizelles. Yum. If you have never been to a farmer's market, I highly suggest that you do so. Not only are you supporting your local farmers, but you are purchasing quality veggies and fruits and goods that have not been shipped from other countries, and have not been sprayed with chemicals, etc. I look forward to making the market a Saturday ritual for our family again this summer. You know I wouldn't be here if not for this cottage community in which we live, Ligonier. Here's a shot of my mom the day she met my dad at my great aunt's cottage. The field you see behind her was next to Ruthie's diner right were the turnaround that destroyed the cottage sits. I always wonder what was so important about that turnaround that it needed to take out such a wonderful little cottage lined lane. Anyway, please visit the article that Cookie Lady has so graciously shared and think about why we love living here and how we can preserve the unquantifiable "wonderful" we know still survives before it's gone. 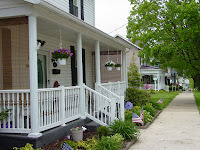 Most, though not all, of these charming houses have a front porch very close to a public sidewalk creating a close pedestrian neighborly sense of community. Most, though not all, have private gardens in the rear and if there is a garage, it is detached and accessed via an alleyway, again, in the rear. 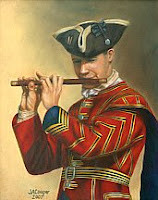 OK...here's one of my Ligonier favorites. I know nothing about this house or who lives here but it always makes me smile. I love that it sits on this quirky little corner lot. It's always so neat and the garden is cheerful. little houses and noted this simple but charming house on the way. 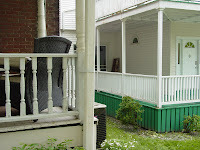 and made note of the more modest but still charming homes that populate that block. Notice how closely they all sit to one another and the sidewalk. It's all very cozy and pedestrian. I continued up Loyalhanna and, of course, noted these two big beauties. 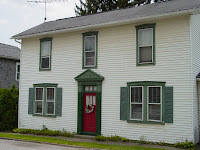 In a very short walk, I found several wonderful examples of houses that create that quaint charm I love about living in Ligonier. I started here at Loyalhanna Realty because I needed to return a couple of spot lights to Leslie. ....our local artiste, musician, real estate agent, rehab guru, set designer, and all around great gal and my friend. 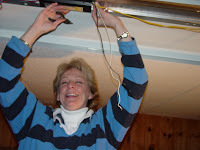 She fixed it and said, "let there be light"
Hey, when I wasn't looking Rachel blew into blog town! Hello! Welcome Rachel to Ligonier Living as a contributor. Make yourself at home, put on your comfy blog shoes and post at will. Are you a thrift shop safari junky? 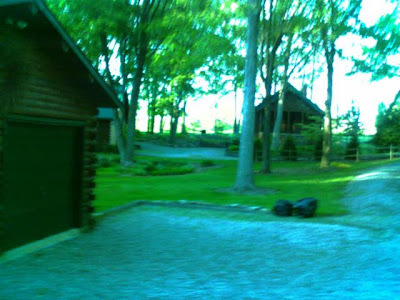 We have some great spots in Ligonier and the hunting is good. If you've got some other area favorites, please comment and share! ...with the Saturday morning Country Market on the 24th and Sunday evening Band Concert on the 25th. These are Ligonier favorites. If you planning to visit town, here's the inside info. Plan to get to the Country Market early [opens at 8am] and have some great coffee and maybe a delicious breakfast sandwich or pastry. Everything is fresh and oh so good. Stroll through the booths and you'll find great food and lots of wonderful handmade and homegrown good stuff. If you're a gardener, now's the time to get great deals on those perennials you've been wanting. Spend the weekend in Ligonier. There's a whole lot to do. 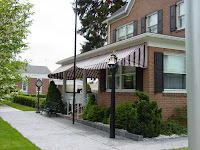 Check some of the links here on Ligonier Living. Cap the weekend off with the Sunday evening Band Concert. Folks just bring a lawn chair and sit in the Diamond park and listen to some old fashioned music. Pop on over to Abigail's and get an old fashioned ice cream cone and have a ball.